Madam, I am not in the habit of substituting for spurious Santa Clauses. 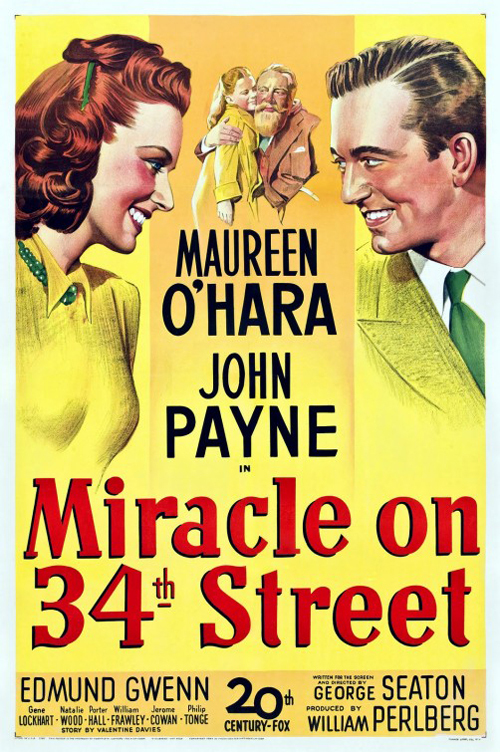 (SPOILERS) Chances are, if you ask a random person who isn’t twelve years old to name three classic Christmas movies, one will be It’s a Wonderful Life, and one of the other two will be this evergreen tale of upholding the “right” kind of seasonally materialistic values. 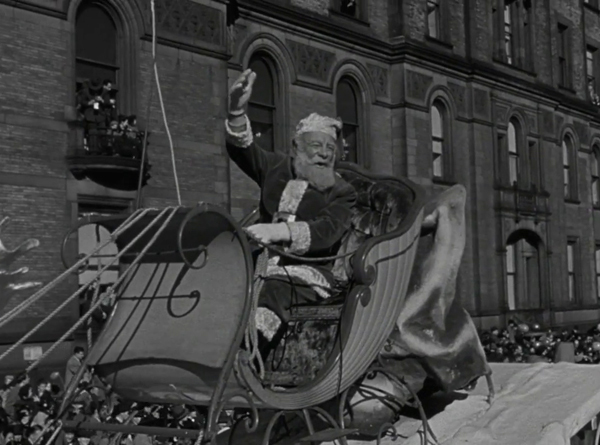 More recently, Chris Columbus attempted to inject a degree of commentary into his rewrite of Jingle All the Way, and cynicism towards the push-pull of a supposedly hallowed festival providing a chance to over-indulge and imbue kids with the qualities of greed and possessiveness crops up in most modern takes on the subject. 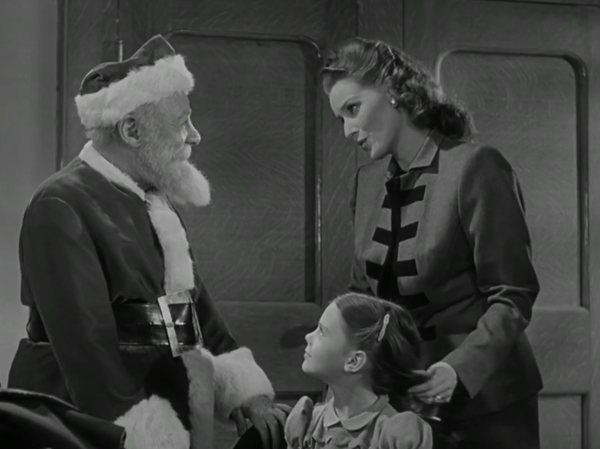 Miracle on 34th Street has an especially canny take on the consumerist angle, and an honest one; when it comes to telling the truth about Santa Claus, the answer is whatever is best for business. Even cannier is that it inevitably means it’s also whatever is best for winning votes. 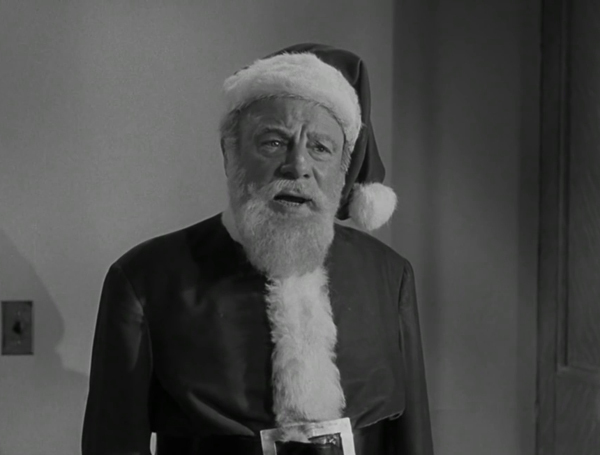 Naturally, the filmmakers were in the same bind as their fictional figureheads of business and justice, so they couldn’t offer a non-affirmative response when it came to whether Kris Kringle (Edmund Gwenn) is actually Santa Claus, a Santa who just happens to be slumming it right now at Brooks Memorial Home for the Aged on Long Island. In fairness to them, though, they didn’t do the likely route of anything Santa-related today and unequivocally have him shown to be the real deal. Everything that happens gift-wise relates to circumstance or likely parental purchase, and about the most amazing talent Kris displays is fluency in Dutch. Kris Kringle: Madam! I am not in the habit of substituting for spurious Santa Clauses. Gwenn’s Kringle is a jolly nice chap, of course, but not impossibly or wretchedly so. He’s only roused to ire when – probably the first of many inspirations that led to Billy Bob Thornton as Bad Santa – remonstrating an intoxicated Santa during a parade. Consequently, there’s little real tension in waiting to see him denounced or vindicated, particularly when he’s given to spouting homilies such as “Oh, Christmas isn’t just a day. It’s a frame of mind” (a frame of mind that rarely occurs on other days, probably because said mind hasn’t been massaged into a stupor from all those goodies and grog). It’s a fait accompli that we assume his right to be the bona fide Santa or a bit mad and simply claim he is. Fred Gailey: Don’t you see? It’s not just Kris that’s on trial, it’s everything he stands for. It’s kindness and joy and love and all the other intangibles. Writer-director George Seaton instead focuses on the importance of what Kris symbolises, and while there’s no mention of the religious meaning of Christmas herein, for all the essential sincerity of the message, the film does trump up faith in something other – not Jesus, admittedly – as essential to the human spirt. 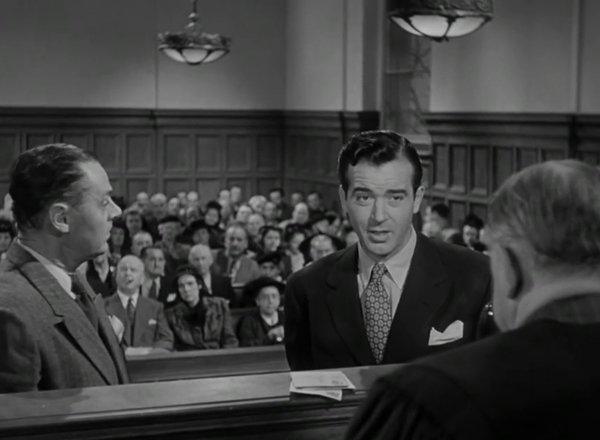 As defence attorney Fred Gailey (John Payne) says, “Faith is believing in a thing when common sense tells you not to” (I’m not sure that’s exactly the definition, but what the hell, let’s go with it). Which underpins both the movie’s strongest suit (Santa on trial!) and its more laboured side dish, the dilemma of winsome moppet Natalie Wood, brought up by mum Doris (Maureen O’Hara, only 27, but believably a decade older in her no-nonsense eschewing of frivolity) to hold fake news in contempt. Fred, realising that she has “No Santa Claus, no fairy tales, no fantasies of any kind” in her life, and being hot on her mum (a divorcee; perhaps surprisingly there’s no judgement on her status, or on remarrying and finding happiness, except from the Catholic League of Decency in their response to the picture), is very keen to have Kris interpose himself on their lives as much as possible, with his emphasis on the power of imagination (“That’s when you see things but they aren’t really there” defines Susan over maturely) rather than cold, arid facts. 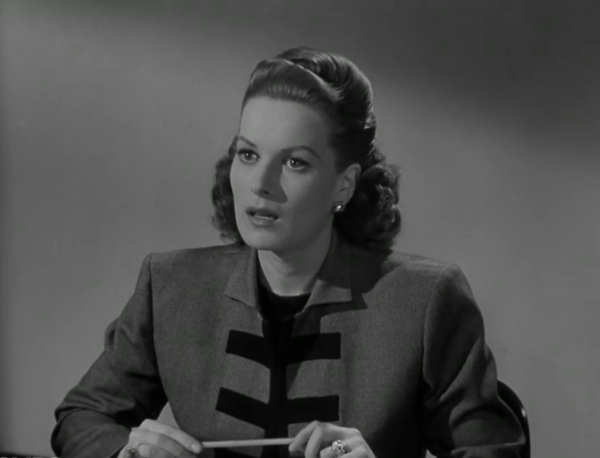 It’s a cute dichotomy to grapple with, whereby Doris thinks one should be completely truthful with children, which of course one should… Except that telling the truth rather depends on knowing the truth in the first place, and then whether it’s in the moppets’ best interests to withhold or reveal it. 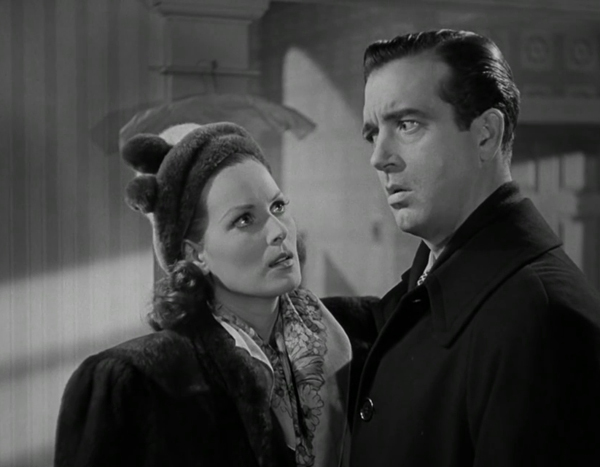 Doris could have come across as rather cold and unsympathetic, so it’s lucky the makers managed to secure O’Hara’s services (she had moved back to Ireland at that point). Doris is empathic even when she’s being ruthless regarding the facts. It’s a typical Hollywood cheat too, that it’s the men promoting escape into fantasy but the oppressive women are guilty of holding them back (“Whatever I want, my mother will get. If it’s sensible and doesn’t cost too much, of course” comments Susan, who most wants a house to live in, something it seems might be outside of Kris’ powers to provide). 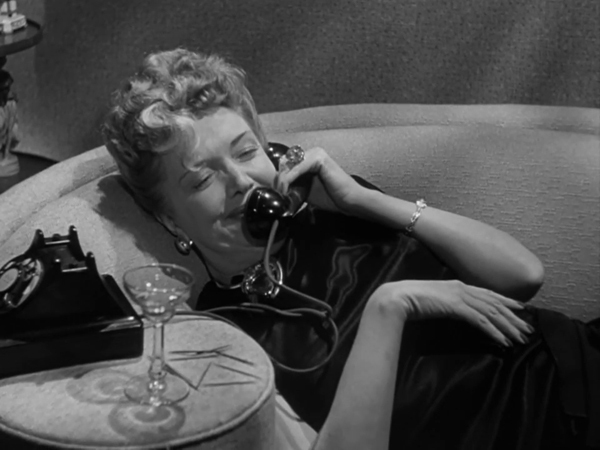 As such, Doris’ suddenly coming on board with the merits of fantasy is a little on the inelegant side, the screenplay failing to focus sufficiently on her journey, but O’Hara inhabits the part such that she makes you believe she might. Thomas Mara: Do you believe that you are Santa Claus? Thomas Mara: The State rests, your honour. 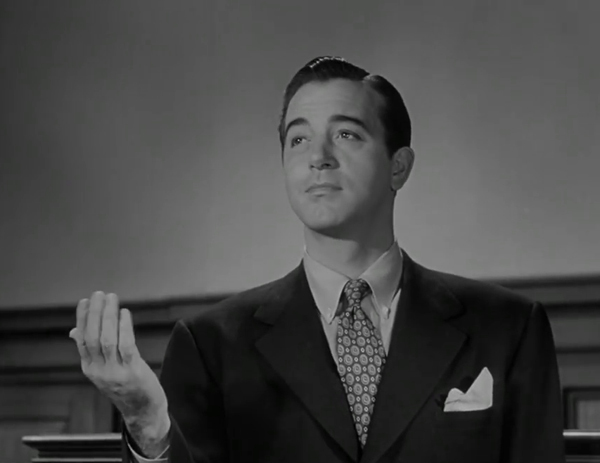 It’s Payne who makes the most of a gift of a part, though (he has few other notable roles), since Fred espouses all the most virtuous principles, identifying precisely where Doris is wrongheaded and proving it to her and winning her, indulging Kris without a hint of doubt, and only practising law in the first place for underdog cases like this (leading him to quit his employer when he’s accused of “jeopardising the integrity of an old and established law firm”). Fred Gailey: I intend to prove that Mr Kringle is Santa Claus. Thomas Mara: He’s crazy too. 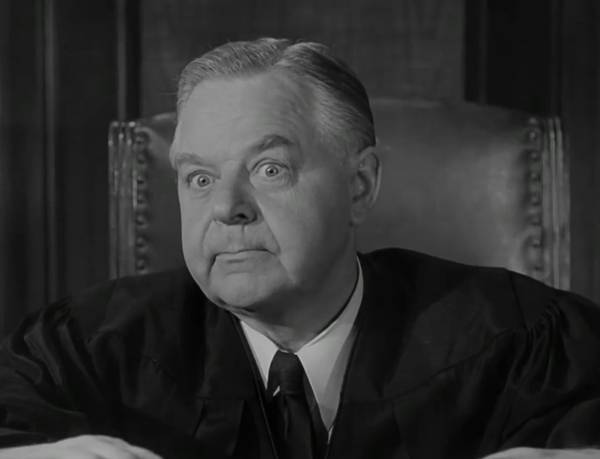 The case succeeds due to equal parts Fred’s deft defence and Judge Henry X Harper’s (Gene Lockhart) Pilate-like desire to go whichever way public opinion will vouchsafe his re-election (plus, even his family is shunning him for agreeing to try the case). The latter’s attitude is essentially the corridors-of-power equivalent to RH Macy (Harry Antrim) coming on board with Kris’ altruistic approach to Christmas, beguiled by the idea of “The store that places public service ahead of profit… And consequently, we’ll have more profits than ever before”. Harper’s looking for a quick exit and finds it, despite the interjections of District Attorney Thomas Mara (Jerome Cowan). Thomas Mara: Your honour, the state of New York concedes the existence of Santa Claus. 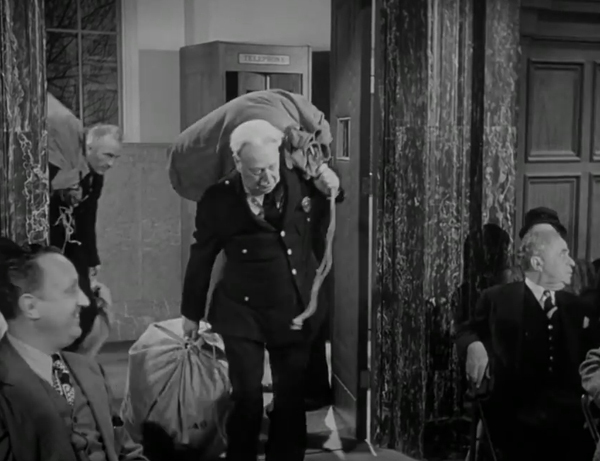 There are two standout defence manoeuvres, the first as Fred calls Mara’s son Thomas Jr (Bobby Hyatt), who unreservedly announces that his father told him there was a Santa Claus, and “My daddy wouldn’t tell me anything that wasn’t so, would you daddy?” The second comes by way of the logic that it’s a criminal offence to wilfully misdirect mail and so, since the US postal service, an arm of the US Government, is delivering mail to Kris Kringle, the Government must be implicitly accepting of his veracity. The movie includes a number of other notable asides adding to an air of playful irreverence, dampening its sincerer impulses. Despite a cautionary line that he is non-representative of his profession, there’s clearly a desire to paint psychology as a promulgator of all life’s ills, with the instigator of the case, Granville Sawyer (Porter Hall, who’s great in the role), an unrepentantly meddlesome and misery-inducing individual, one who even resorts to pretence to make his mark (and ends up fired when his plans don’t suit his corporate boss). Then there’s Julian Shellhammer (Philip Tonge), the Macy’s man initially persuaded to put Kris up, but who knows Mrs Shellhammer (a very funny Lela Bliss) will need some inducement; a couple of double-strength Martinis after dinner should put her in a more receptive frame of mind. “I’ll call you as soon as my wife’s plastered” he announces. When he does, she has already knocked back triple-strength ones. The Hon. Henry X Harper: Since the US Government declares this man to be Santa Claus, this court will not dispute it. Case dismissed.